Major General Glenn H. Curtis is the Adjutant General for the Louisiana National Guard. He is responsible for the deployment and coordination of programs, policies and plans affecting the more than 11,500 members of the Louisiana Army and Air National Guard. General Curtis graduated from Buckeye High School. He holds a Bachelor of Science degree in Agriculture Business from Louisiana State University and a Master’s Degree in Strategic Studies from the United States Army War College. General Curtis enlisted in the Louisiana National Guard in March 1982. He attended the Louisiana National Guard Officer Candidate School and was commissioned a Second Lieutenant in August 1984. From July 1986 to September 1997, General Curtis served in various positions of increasing responsibility from Platoon Leader, Construction Officer, S-4, Company Commander, Plans Officer, S-3, and Executive Officer. General Curtis served as Battalion Commander of the 1088th Engineer Battalion in Plaquemine, Louisiana from September 1997 to April 2000 and 3rd Battalion, 156th Infantry in Lake Charles, Louisiana, from April 2000 to August 2001. He was assigned as the Commander of the 225th Engineer Group from September 2001 to October 2004. General Curtis also served as the J-4, Director of Logistics, Joint Force Headquarters-Louisiana. He was mobilized in support of Operation Iraqi Freedom in December 2004 and served as the Chief of Staff, Purchasing and Contracting Officer in Baghdad, Iraq. In November 2005, following Hurricanes Katrina and Rita, General Curtis was assigned as the Chief of the Joint Staff, Joint Force Headquarters-Louisiana. 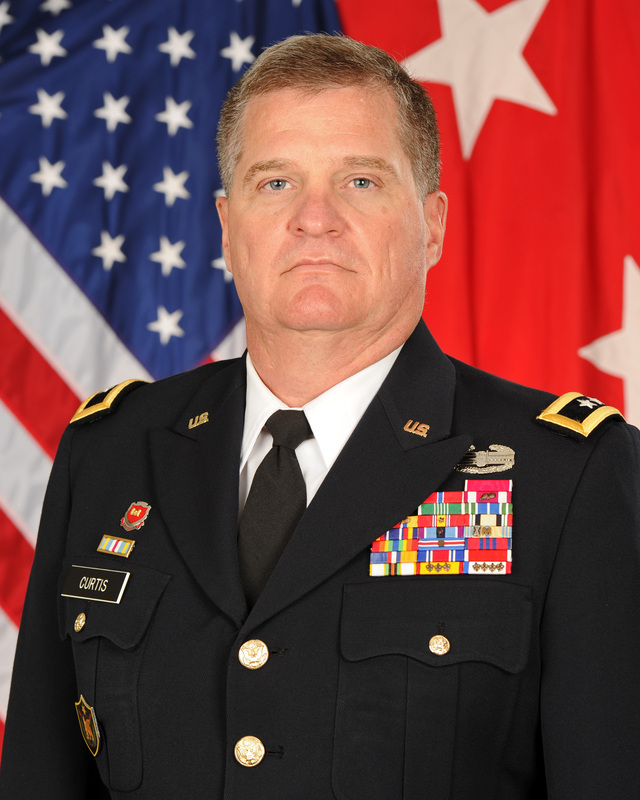 General Curtis served as the Director of the Joint Staff from 1 April 2007 until 3 November 2011 when he was appointed as the Adjutant General. General Curtis’ military education includes the NBC Defense Officer/NCO Course, Engineer Officer Basic Course, Defense Hazardous Materials Handling Curse, Unit Movement Officer Course, Engineer Officer Advanced Course, Combine Arms and Services Staff School, Command and General Staff Officer Course, and the U.S. Army War College. His awards, decorations, and honors include the Legion of Merit, Bronze Star, Meritorious Service Medal with two Oak Leaf Clusters, Army Commendation Medal, Army Achievement Medal, Combat Action Badge, Joint Meritorious Unit Award, Army Reserve Component Achievement Medal with one Silver and two Bronze Oak Leaf Clusters, National Defense Service Medal with one Bronze Service Star, Iraq Campaign Medal, Global War on Terrorism Service Medal, Humanitarian Service Medal with one Bronze Service Star, Armed Forces Reserve Medal with Silver Hourglass and “M” Device, Army Service Ribbon, Army Reserve Component Overseas Training Ribbon with Numeral 2, Louisiana Legion of Merit, Louisiana Commendation Medal, Louisiana Retention Ribbon, Louisiana War Cross, Louisiana Cold War Victory Ribbon, Louisiana Emergency Service Medal with two Bronze Fleur-de-Lis, and Louisiana Longevity Ribbon with four Bronze Fleur-de-Lis. General Curtis resides in Alexandria, Louisiana. He is married to the former Jill Juneau and is the father of three children: Meagan, Nicholas, and Jacob.